Looking for an advanced flute to meet your advancing technique? 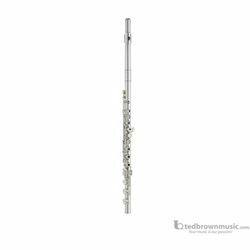 The Yamaha YFL-677HCT Professional Flute may be just the flute for you. A great choice for ambitious students or accomplished local professionals, the YFL-677HCT incoroporates many premiere features including French (open hole) Keys, drawn & rolled tone holes, and a hand finished Type A headjoint, designed just like Yamaha's handmade 800 & 900 series flutes. This unique 677 model (677HCT) also features a C# trill key.